I think our ERT might have helped just a little bit haha. Very pleased to see Maverick continue its climb to the top. It looks like it's finally getting the praise it deserves making a statement this year. My 2 highest rated steel coasters finished 5 and 6 in the poll so glad to see them do well and me riding 2 of the best coasters in the world. Also seeing Bizarro slip a little. I believe this is the first year it's been lower than #3 so that's also a big result. Did anybody notice Diamondback is in the 40s? Also I find it amazing TTD is ranked 18th and KK is 75th. I haven't ridden either but I feel like there's some CP bias there. 1 last thing, I'm not sure where X2 was last year but I feel like it moved up this year being 21st. coasterkyle wrote: I think our ERT might have helped just a little bit haha. No kidding, after that night is when Maveshark moved into my top 10. 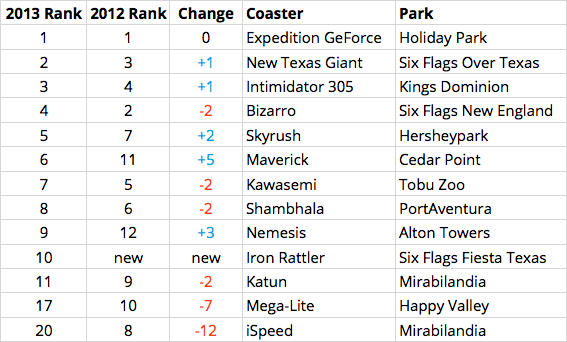 I love seeing Ntag and Skyrush move up. Also love seeing Iron Rattler up that high. yankeeman311 wrote: 1 last thing, I'm not sure where X2 was last year but I feel like it moved up this year being 21st. I remember it was at #25 or something. Interesting Fav Vekoma Boomerang still scores so low - but many have not yet ridden one with Vekoma's new trains featuring the vest-style OTSR which are a BIG improvement. Looking forward to riding many of the top coasters next year vacationing the US! yankeeman311 wrote: Also I find it amazing TTD is ranked 18th and KK is 75th. I haven't ridden either but I feel like there's some CP bias there. TTD is a much more enjoyable ride than KK. Smoother and better restraints but it should not be that much higher than KK. iSpeed dropped a few spots while losing quite a few match-ups by only a vote. I'm a huge fan of iSpeed and unfortunately couldn't find the time to vote this year. I'll apologize to iSpeed in person next time I'm at the park. Last edited by larrygator on Wed Apr 16, 2014 12:29 pm. gerstlaueringvar wrote: Hahaha GateKeeper at #108 while Shambhala at #8, Sky Scrapper is at #19... Perfect prove that B&M does a better job outside of US. What happened to iSpeed this year? From #8 to #20? Wing coasters in general are hated by a lot of people here, not just American wing coasters. GigaG wrote: Wing coasters in general are hated by a lot of people here, not just American wing coasters. Also what is the actual ranking purpose of the poll, I gather it is the coaster that you have the most fun on? Not the coaster that made you scared the most? Leviathan at #13 and Millennium Force at #14. I have not been on Leviathan yet and I am surprised it beat Mille per all the reviews offered last year by riders on this site. Any comments from people who have been on both of them? Just curious.